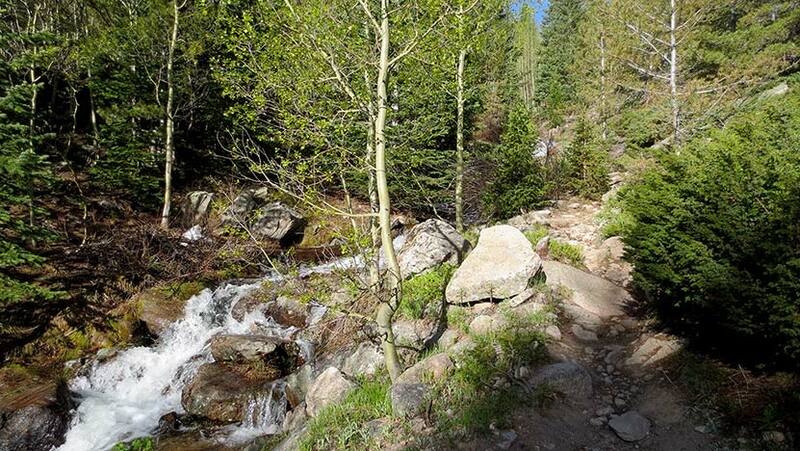 The St. Vrain Mountain trail is just a 3-mile hike into Indian Peaks Wilderness to stunning views of the rocky peaks of Wild Basin. 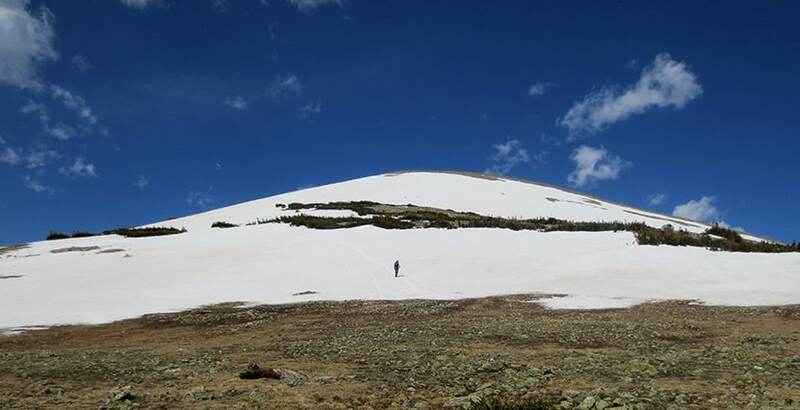 Hike up and additional 1.5 miles from the RMNP boundary to the summit of St. Vrain mountain for 360-degree panoramic views of a wildflower-laden wilderness. 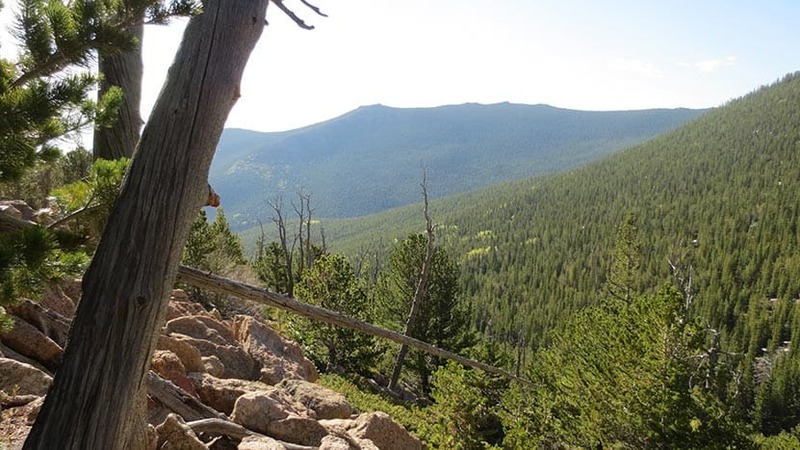 Explore the full St. Vrain Mountain hike profile below for trail map, driving directions, and more. From Denver, take Interstate 25 to either 36 or 66 to Lyons. In Lyons, follow 7 to Allenspark. In Allenspark, turn left onto Ski Road – FR-107. This will be marked with a street sign and a home-crafted sign made out of an old pair of skis. Follow this dirt road as is weaves through Allenspark then a series of dispersed cabins for about 2 miles until the road terminates at the trailhead. 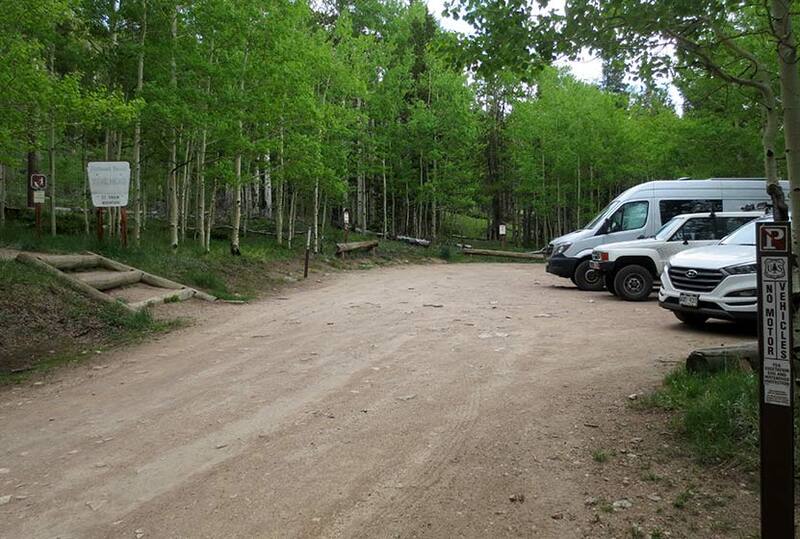 There is parking for only about 8 vehicles at the trailhead. There is additional parking along the road, but make sure that you’re not blocking cabin drives or tearing up the roadside. You may have to park a ways back down the road if crowded. I hiked this on the weekend and the lot was full around 8 AM. 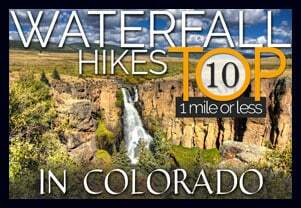 There are not restrooms or potable water at the trailhead. The hike begins in the shade of aspen, spruce, and lodgepole pine forest. This first segment is easy and gradual, getting steeper as the sounds of distant St. Vrain Creek grow louder and closer. Wildflowers become more prevalent and soon the trail begins to follow right alongside the course of the creek. Then the switchbacks begin. I hiked this in late-May after a Winter when our snowpack was below normal. So it was snow-free until around mile 2. From about mile 2 to mile 3, intermittent snow covered about 3/4 of the trail. I didn’t bring snowshoes but had it been early May, I definitely would have needed a pair. Trekking poles were essential for negotiating the trail and to keep from post-holing up to my waist. It could be done without poles, but I’d definitely recommend having them. At treeline, things open up to blue skies and high-country tundra brightened by the many colors of summer wildflowers. In early-May, these were just beginning to bloom. However, come mid-June, the creek alongside the trail and these upper reaches of high-country should be replete with wildflowers. Once you crest the saddle, the views are outstanding. To the Northwest, the entire Wild Basin of Rocky Mountain National Park opens up before you. 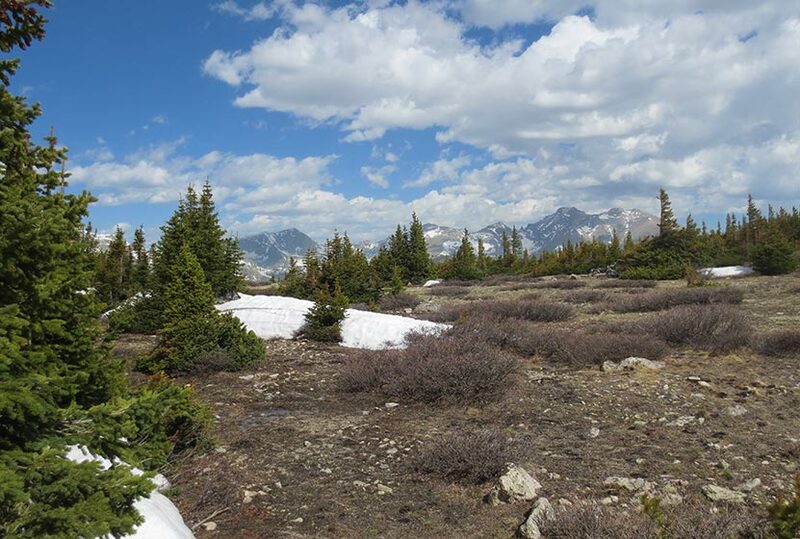 To the North, you’ll find Meadow Mountain, elevation 11,632′. 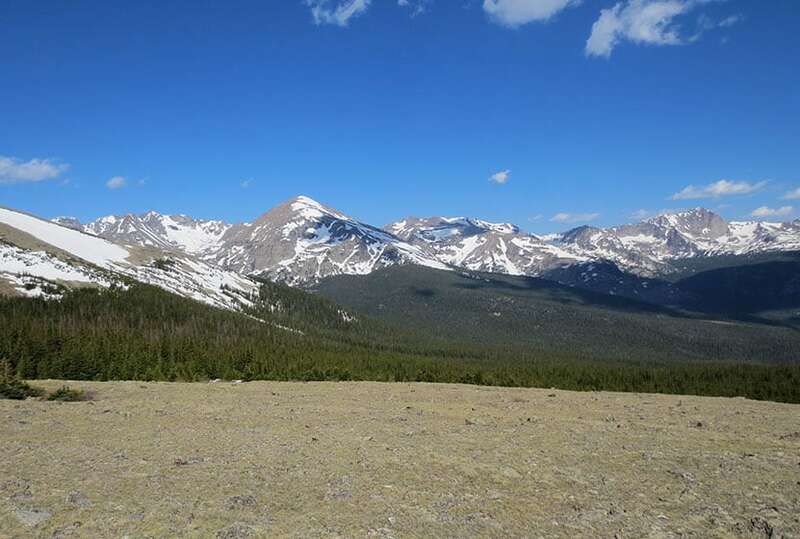 I met a local from Allenspark along the trail and he said the views from the summit of Meadow Mountain rival those of St. Vrain because of the perspective looking down into the Wild Basin area. At mile 3, the trail enters Rocky Mountain National Park. From this point, I could see a faint trail in the snow leading up the rounded ridgeline of St. Vrain Mountain. 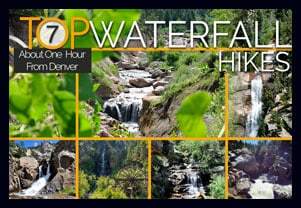 It’s about a 1/2 mile hike from the main trail to the summit with about 700 feet of elevation gain. 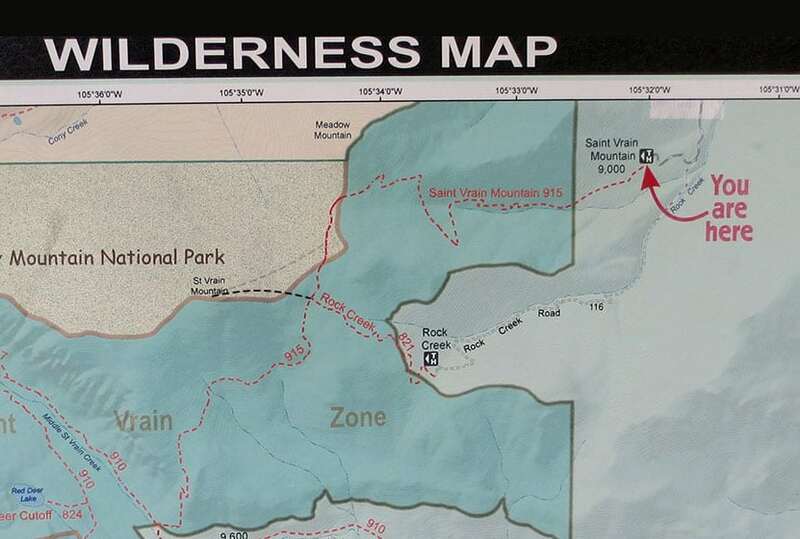 Below is a photo of the map found at the trailhead. I’ve added a dark-black dashed line to indicate the trail that goes from the junction with the Rock Creek Trail to the summit. The lighter-grey dashed line indicates the path hikers were taking across the snow to the slopes of St. Vrain Mountain. Be sure to hike on durable surfaces (snow, rock, trails) on the summit approach to protect the fragile tundra environment. TIP: Trekking Poles are a must on this trail. 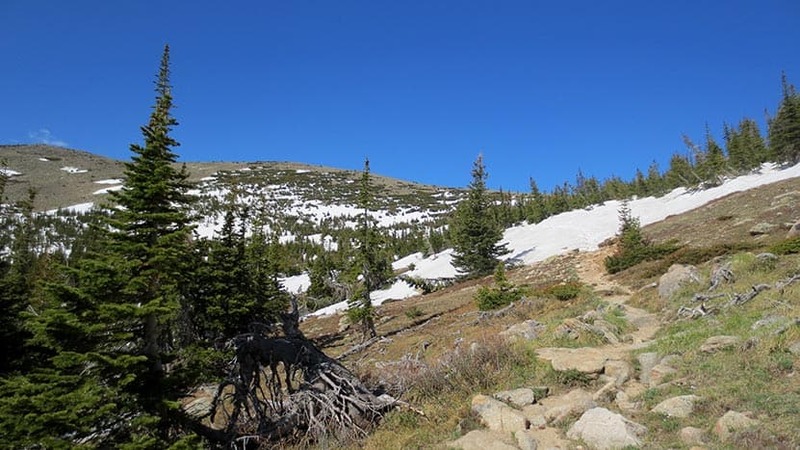 They will be especially helpful to negotiate the snow that covers the upper reaches of the trail in late-Spring through early Summer. TIP: Apply sunscreen as the trail is mostly exposed to the sun. 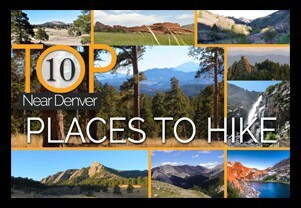 Similar Hikes: Flattop Mountain, Windy Peak, Carpenter Peak.